Cellulose acetate synthesis from cellulose In a round bottom flask, cellulose (2 g, 12 mmol) was suspended in acetic acid (35 mL) and stirred for 1 hour at 55 °C. Thus, a mixture of acetic anhydride (10 mL, 105 mmol) and sulfuric acid (0.4 mL, 7.5 mmol) was slowly added, while the mixture was kept at 55 °C for 2 hours3 . The mixture was thus poured into cold water, the precipitate was filtered, washed and dried at 40 °C in a vacuum oven. Cellulose acetate synthesis from pulp or wood In a round bottom flask, 2 g of wood or pulp were suspended in acetic acid (35 mL) and stirred for 1 hour at 55 °C. Thus, a mixture of acetic anhydride (10 mL, 105 mmol) and sulfuric acid (0.4 mL, 7.5 mmol) was slowly added, while the mixture was kept at 55 °C for 2 hours3 . The mixture was poured into cold water, the precipitate was filtered, washed and dried at 40 °C in a vacuum oven. In order to purify the cellulose acetate, the precipitate was stirred in dichloromethane (30 mL) at 30 °C for 1 hour; afterwards 2/3 of the solvent was evaporated with a rotary evaporator and poured into 20 mL of ethanol, the precipitate was washed with ethanol and dried at 40 °C in a vacuum oven. General procedure for the acetolysis of cellulose acetate Solutions of cellulose acetate in acetic acid were prepared under the approximation that all cellulose acetate is composed of triacetylated anhydroglucose units (molar mass: 288 g/mol). The following molarities (mM) and the number of equivalents are therefore calculated with respect to triacetylated anhydroglucose units. Briefly, the corresponding amount of cellulose acetate to reach a final concentration of 5 g/L (17.4 mM) of cellulose acetate were dissolved in acetic acid and 35 mM of acetic anhydride (2 eq) and 35 mM of acid (2 eq) was added each run, unless otherwise stated. (The same procedure was adapted for non-acetylated cellulose [molar mass: 162 g/mol] as control experiment). The use of biodiesel has been promoted for the past decade as a substitute for fossil-based diesel fuel. However, it has become evident that its production competes with food production by engrossing cropland. To overcome this Corma has developed a process that uses 2-methylfuran which currently is isolated (280 × 103 tonnes per year) from nonedible biomass ( Angew. Chem., Int. Ed. 2011, 50, 2375−2378). The first step is the trimerization of 2-methylfuran which takes place in water mediated by sulfuric acid in 94% yield. The trimer is then subjected to hydrodeoxygenation using a mixture of Pt/C and Pt/TiO2 and 5 MPa of hydrogen in 97% yield. Of particular note was the use of no organic solvent in the process. This route opens new routes for the production of high-quality diesel from waste biomass. 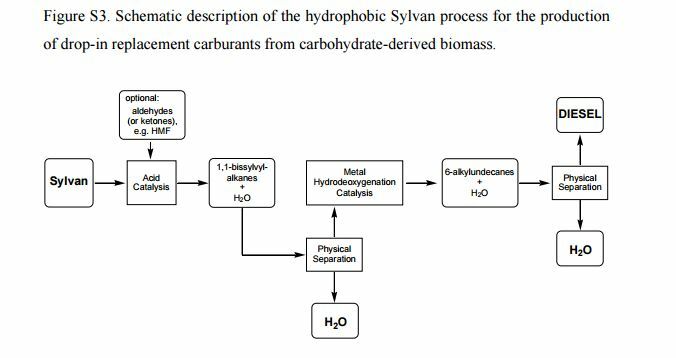 High-quality liquid fuels are obtained from non-edible carbohydrates by energy-efficient processes. 2-Methylfuran, produced by hydrogenation of furfural, is converted into 6-alkyl undecanes in a catalytic solvent-free process (see scheme with 6-butylundecane). A diesel fuel is produced with an excellent motor cetane number (71) and pour point (−90 °C) and with global process conversions and selectivities close to 90 %. 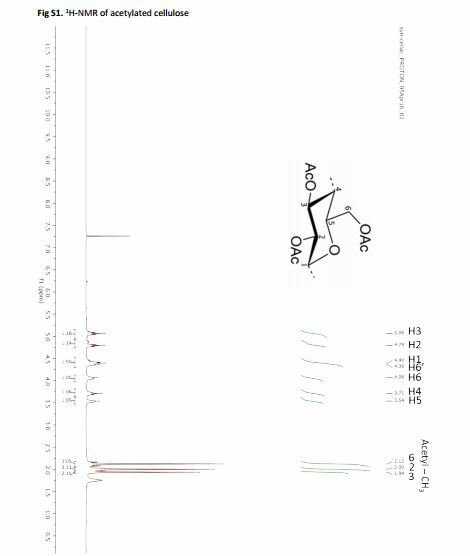 5-hydroxymethylfurfural (0.500 g, 3.95 mmol) was dissolved in 2-methylfuran (2.00 g, 24.4 mmol) at room temperature, Amberlyst-15 (50 mg) was added as catalyst, and the reaction mixture was stirred for 24 h at room temperature. Then, the catalyst was filtered out and washed with ethyl acetate. 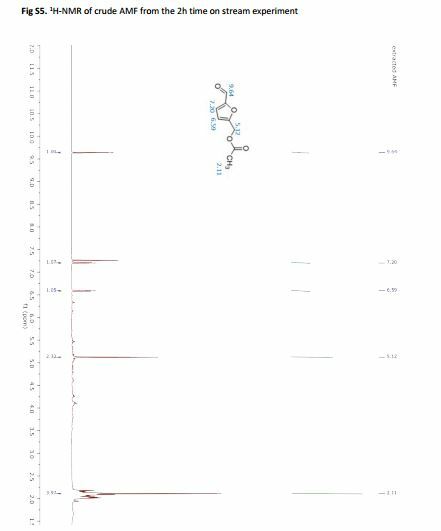 The filtrate obtained was concentrated under vacuum and the residue was purified by silica gel column chromatography (95 : 5 hexane : ethyl acetate changing to 70 : 30) and 5-[bis(5-methyl-2-furanyl)methyl]-2- furanmethanol was obtained (0.921 g, 3.39 mmol, 86% yield). Elemental analysis: C16H16O4 required: C, 70.57; H, 5.92; found: C, 70.57; H, 6.09 %. Synthesis of trissylvylmethane (2,2′,2”-methylidenetris[5-methylfuran]) from 2- methylfuran (Sylvan) and 5-methylfurfural employing a 5 : 1 molar ratio of 2- methylfuran and 5-methylfurfural in presence of para-toluenesulfonic acid as catalyst. In a 1-L three-neck round-bottom flask, equipped with a reflux condenser and a mechanical stirrer, 2-methylfuran (Sylvan, 600 g, 7.25 mol) and para-toluenesulfonic acid (13.8 g, 80.1 mmol) were placed. Under stirring 5-methylfurfural (160 g, 1.45 mol) was added at a rate of 120 mL/h at room temperature. The reaction mixture was stirred at 50 ºC until a total reaction time of 6 h. The aqueous phase was separated and discarded. The organic phase was treated with NaHCO3 and with MgSO4 and the excess 2-methylfuran was distilled off with a rotary evaporator. 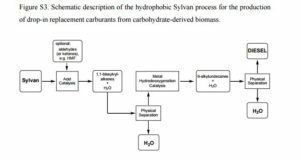 Distillation provided the desired product 2,2′,2”-methylidenetris[5-methylfuran] as a colorless liquid in 97% purity (120 ºC, 2 HPa; 365 g, 1.35 mol, 93% yield). A distillation residue of 49.1 g was obtained. 1 H NMR (300 MHz, CDCl3) δ = 5.99 (d, J=3.1, 3H), 5.93 – 5.89 (m, 3H), 5.39 (s, 1H), 2.27 (d, J=0.8, 9H).- 13C NMR (75 MHz, CDCl3) δ = 151.4, 150.7, 107.8, 106.2, 39.1, 13.6. A new integrated strategy for the synthesis of GVL from beechwood based on the use of 2-MeTHF and RANEY Ni is presented. An integrated method for the production of γ-valerolactone from cellulosic biomass is presented here. A combination of acidic water hydrolysis of the biomass followed by extraction with methyltetrahydrofuran is used to generate a levulinic acid feed, which is further hydrogenated into the platform chemical γ-valerolactone using RANEY® nickel as a catalyst.